By my count, 329 advertisements have been posted for these types of positions so far this year. This is up 5% from where we were last year, up 15% from 2010, and up a whopping 73% from 2009. That said, this year is down 8% from 2008, a year that was a horrible market according to a 2009 ASA study. In prior years, about 80% of jobs that were going to be listed were posted by the end of November. Based on that, I estimate that we’ll come in at about 410 jobs this year, which is 15 jobs less than my forecast based on July, for those who care about that sort of thing. My best guess is that this is about how many jobs we can expect to see posted in the coming years. I doubt we’ll see a surge in money for hiring in the social sciences given the current political and economic climate. I’m a little surprised to see any tenure-track jobs being posted February or later. Did you notice any difference between late postings and the July-October period? I was surprised too. Made it tricky to decide when the start of the hiring season was. I haven’t really looked at the content of the advertisements, but I bet they skew towards smaller places and jobs in non-sociology departments. Non-American universities are another possibility. I’m assuming they are included in the sample? Non-American schools are in, so that’s probably part of the story. Those ads are for the fifth tier or so, and many of our students from SIU do well in that market. They get teaching-focused jobs and maybe low pay, but they get real TT jobs, and usually in areas with a low cost of living. 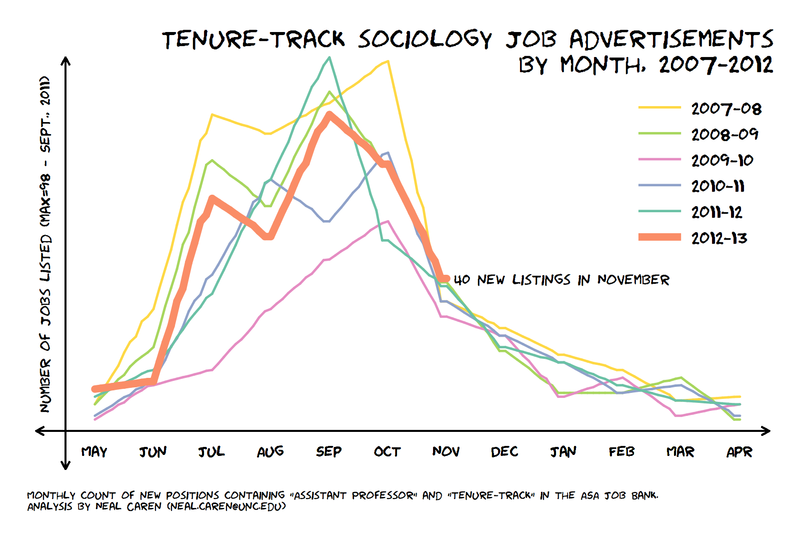 I think the ads tend to appear late in the sociology job cycle because sociology’s job cycle is early compared to most other disciplines (economics doesn’t even start interviewing until January), and because those schools are generally under tighter budget control so deans and provosts tend not to guarantee money for slots until what we in sociology think is late in the year. Schools that post later are typically non-PHD programs, often smaller schools or departments that are sociology-anthro and social science. It is not uncommon for students to get job offers in April and May. My department’s position announcement (http://jobbank.asanet.org/jobbank/job_detail.cfm?jobid=8976) went live 11/29, and that required a considerable and concerted effort on the part of our chair to get everything done as quickly as possible. When I was hired, I applied in December, had my campus visit in late March, and received an offer in April. I had several other interviews on a similar schedule. Props for the xkcd ggplot theme. I’m embarrassed to say the graph is 100% Stata. The silence of the Stata community to the early November xkcd-style graph craze and the hassle it is to produce these in Stata might be what finally pushes me to R side. Yeah, because labeling the vertical axis is *so* 2010. I assumed you traced the squiggly lines by hand. That would be cool. Otherwise I’m not so sure. Sorry to disappoint you Philip but the squiggles are a computer-generated jitter after interpolating points between each month. Humor Sans font. Default axis turned off and drawn with pcbarrow and scatteri for the y title. Legend is ring(0) position(2). I made the original version of the graph in early November after the Randall Munroe style had already been successfully ported to ggplot2 for r and matplotlib for Python. The Stata version implementation needs work, but I think I’ve done all I can do.